How will Scolio-Pilates help ALL my clients? 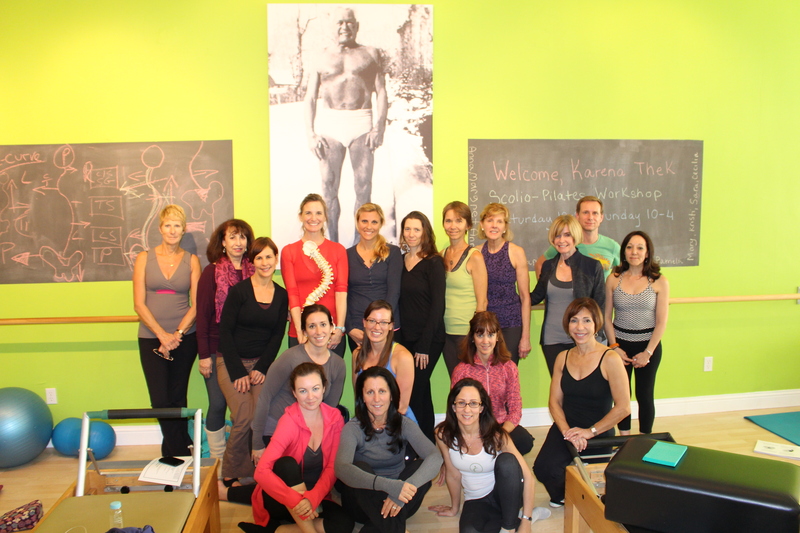 Karena, How will Scolio-Pilates help ALL my clients? I only have one scoliosis client, is this really worth it to me? Scoliotic spines are just like the rest of the spines you work with. The only difference? They are an exaggeration of all those other spines. Well, after teaching for awhile, you now know that kyphosis doesn’t have to look like that in order to be an issue. It can be a much milder version. It will still affect how the shoulders rotate, how the neck turns and even the mobility of the hips. Your client might even have such a slight kyphosis that it wouldn’t even necessarily be described as kyphosis. But you recognize the traits and the side-effects enough to keep your clients and patients safe from things like over-extension of the shoulder joint, too much rotation of the cervical spine and anything but moderate movement at the hip joints. So, again…How will ScolioPilates help all my clients? The same idea of extreme versus subtle applies to scoliosis. When you learn the more “extreme” version of spinal changes that occur in scoliosis, you learn about the same but more subtle changes that all spines make. Scoliosis is made up of rotations, side-bends and a series of hyper-kyhpotic and hyper-lordotic areas of the spine. It’s complex. In scoliosis, the right side is almost always doing something different than the left. The hips and the shoulder joints are directly effected. The arms and the legs are indirectly but strongly affected as well. The Scolio-Pilates® workshop will help you begin to understand all of these subtle changes and what you can do to correct them. Not all these subtle changes need correcting. I am guided by my clients wishes. If they have subtle changes but they feel great, then who am I to mess up a good thing? If they have subtle changes and they need help then I can start applying to my toolbox of knowledge towards helping them. The clients who fit into the latter category are often the clients who go from doctor to physical therapy to massage to acupuncture and now to you, always looking for something that might finally be able to help. To wrap up, not everyone with discrepancies from one side of the spine to the other has scoliosis. But knowing that even small discrepancies can make a big difference in how someone feels and moves through their lives can encourage you to pull out the tools you will learn at the next Scolio-Pilates® workshop to help you help your clients. I hope you can make it, I would love to work with you!